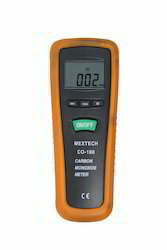 Carbon Monoxide Meter CO180 is a device that detects the presence of the carbon monoxide (CO) gas in order to prevent carbon monoxide poisoning. In the late 1990s Underwriters Laboratories (UL) changed their definition of a single station CO detector with a sound device in it to a carbon monoxide (CO) alarm. This applies to all CO safety alarms that meet UL 2034; however for passive indicators and system devices that meet UL 2075, UL refers to these as carbon monoxide detectors. CO is a colorless, tasteless and odorless compound produced by incomplete combustion of carbon containing materials. Battery 9V, NEDA 1604A or IEC 6LR61, or equivalent.